Is it just me or does it seem like everyone is sick right now? Both Matt and I seem like we are on the verge of coming down with something, a cold or flu maybe. It seemed like a good week for some homemade chicken noodle soup. Chicken soup is such a basic I didn't even think about posting a recipe for it here. Then a friend of mine asked if I was going to post it after she recently had a bad experience with a salty canned soup. Oh, I heard her there, I have a big problem with canned chicken soup too because of the salt and the MSG. Then Matt told me this was the best batch of soup I'd ever made, so I figured I best write it down even if just for my own reference. 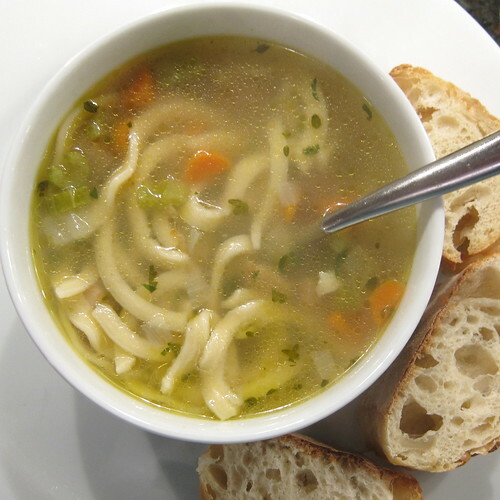 In my book there are three main things needed for a good chicken noodle soup, good stock, fresh parsley and the right noodles. My freezer is almost always full of homemade stock. It's so easy to make and so much better than most you get in the store. All I do is put a chicken carcass or two, a couple of carrots, some celery stalks, a quartered onion, some thyme sprigs and a few crushed peppercorns in a large soup pot. Cover it all with a good amount of water and let it simmer all day. Often I add more water as the day goes on. At the end of the day I strain it into two cup containers and fill the freezer. I've made it with just the carcass and it's been just fine but it's such much better with the vegetables. I do not salt my stock until I use it. Fresh flat leaf Italian parsley seems to be the ingredient that makes my soup taste like the ones we love from a deli. I think it is the fresh, almost citrus flavor it adds. Do not skip it. Ok, I guess I did have a lot to say about this "basic." On to the recipe. 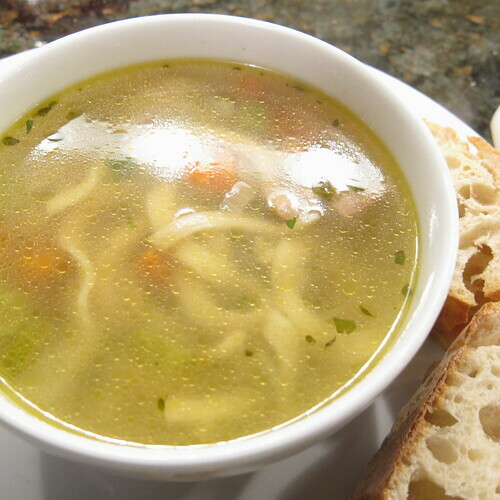 Most recipes I've seen for chicken noodle soup on line have you start with the whole chicken and make the stock. Mine assumes you have the stock already made which means it comes together in about an hour. If you have leftover cooked chicken you can use it in this and just skip the step of cooking it. Heat the olive oil in a skillet over medium-high heat. Season the chicken with salt and pepper. Add the chicken to the pan and sauté until it is no longer pink. Add the onions, carrots and celery. Sauté until the onion is translucent. Put the stock into a large soup pot. Add the cooked chicken and vegetables. Stir in 1 tablespoon of the parsley, the bay leaf and thyme. Bring to a simmer and let cook for 15 minutes. Add the salt and pepper to taste. Bring the soup to a boil. Add the noodles. Let cook at a rolling boil for 16 minutes or for the time required for your noodles. You want the noodles to be cooked but not mushy. In the last minute or two add the remaining parsley. Check once more for seasoning. Oh, how I love chicken noodle soup! It's my absolute favorite. I was just thinking about making some--I have a chicken carcass in the freezer. I'm going to look for these noodles--not sure if I can find the same brand around here, but I have seen some frozen ones. Thanks for the heads up! Oh, on the parsley, too! 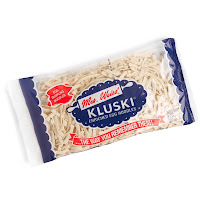 I found some kluski noodles at my local butcher shop. Thank goodness for that find because none of the local stores here carried any. I didn't know that kluski is Polish for noodle. What fun! Thanks for the recipe. I'm going to make this for dinner tonight. Just in time because now everyone here has the sniffles, again. 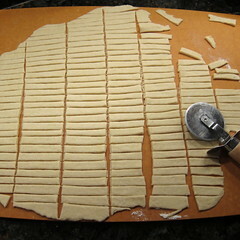 i just don't know if i'd ever have the patience to make my own pasta or even egg noodles.